LADOL recently took part in the Seatrade Maritime Awards 2017 and was the winner of the Africa Infrastructure Award. These are the awards that everyone in the region wants to win and this was an extremely competitive category. 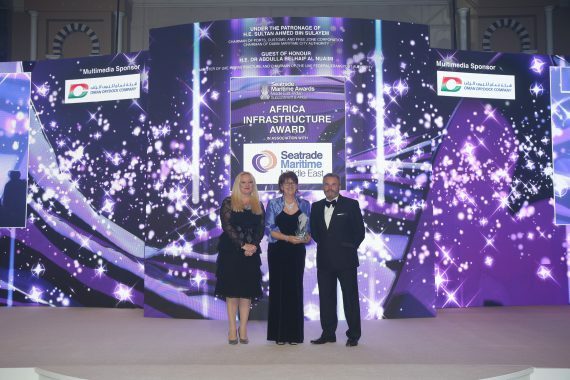 Collected on behalf of Lagos Deep offshore Logistics Base (LADOL) by Mrs Vanessa Stephens, Global Events Director and Managing Director Middle East and Indian Sub-Continent, Seatrade. Presented by Mr Andrew Williams, Aviation and Seatrade Group Director, Seatrade and Mrs Emma Howell, Group Marketing Manager, Seatrade.